Facing the haunting outline of the majestic Wicklow Mountains, Ireland’s Fair City holds true to a 1,000-year Celtic heritage that inspires her music and artistry to this day. 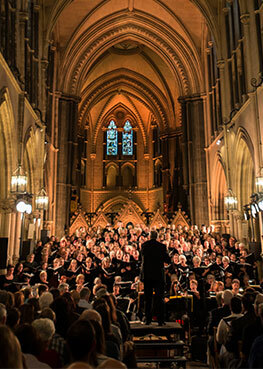 The inaugural Féile Córúil Dublin, or Dublin Choral Festival, will celebrate this great heritage of Celtic musical inspiration. The festival will take place June 19-23, 2019 and June 24-28, 2020. This event will feature mixed-voice choirs and individual singers from a variety of backgrounds joining together to sing en masse. Three days of rehearsals will lead participants to a grand finale performance. The 2019 festival will be led by Joshua Oppenheim and Julie Yu-Oppenheim, Directors of Choral Studies and Kansas State University. The 2020 festival will be led by Dr. Ryan Beeken, Director of Choral Studies at Indiana University of Pennsylvania. Concert and tour production for the event is provided by Music Celebrations International.